Why this war? This is the question my people are asking. This war is not of Georgia’s making, nor is it Georgia’s choice. The Kremlin designed this war. Earlier this year, Russia tried to provoke Georgia by effectively annexing another of our separatist territories, Abkhazia. When we responded with restraint, Moscow brought the fight to South Ossetia. Ostensibly, this war is about an unresolved separatist conflict. Yet in reality, it is a war about the independence and the future of Georgia. And above all, it is a war over the kind of Europe our children will live in. Let us be frank: This conflict is about the future of freedom in Europe. No country of the former Soviet Union has made more progress toward consolidating democracy, eradicating corruption and building an independent foreign policy than Georgia. This is precisely what Russia seeks to crush. This conflict is therefore about our common trans-Atlantic values of liberty and democracy. It is about the right of small nations to live freely and determine their own future. It is about the great power struggles for influence of the 20th century, versus the path of integration and unity defined by the European Union of the 21st. Georgia has made its choice. When my government was swept into power by a peaceful revolution in 2004, we inherited a dysfunctional state plagued by two unresolved conflicts dating to the early 1990s. I pledged to reunify my country — not by the force of arms, but by making Georgia a pole of attraction. I wanted the people living in the conflict zones to share in the prosperous, democratic country that Georgia could — and has — become. In a similar spirit, we sought friendly relations with Russia, which is and always will be Georgia’s neighbor. We sought deep ties built on mutual respect for each other’s independence and interests. While we heeded Russia’s interests, we also made it clear that our independence and sovereignty were not negotiable. As such, we felt we could freely pursue the sovereign choice of the Georgian nation — to seek deeper integration into European economic and security institutions. We have worked hard to peacefully bring Abkhazia and South Ossetia back into the Georgian fold, on terms that would fully protect the rights and interests of the residents of these territories. For years, we have offered direct talks with the leaders of Abkhazia and South Ossetia, so that we could discuss our plan to grant them the broadest possible autonomy within the internationally recognized borders of Georgia. But Russia, which effectively controls the separatists, responded to our efforts with a policy of outright annexation. While we appealed to residents of Abkhazia and South Ossetia with our vision of a common future, Moscow increasingly took control of the separatist regimes. The Kremlin even appointed Russian security officers to arm and administer the self-styled separatist governments. Under any circumstances, Russia’s meddling in our domestic affairs would have constituted a gross violation of international norms. But its actions were made more egregious by the fact that Russia, since the 1990s, has been entrusted with the responsibility of peacekeeping and mediating in Abkhazia and South Ossetia. Rather than serve as honest broker, Russia became a direct party to the conflicts, and now an open aggressor. As Europe expanded its security institutions to the Black Sea, my government appealed to the Western community of nations — particularly European governments and institutions — to play a leading role in resolving our separatist conflicts. The key to any resolution was to replace the outdated peacekeeping and negotiating structures created almost two decades ago, and dominated by Russia, with a genuine international effort. But Europe kept its distance and, predictably, Russia escalated its provocations. Our friends in Europe counseled restraint, arguing that diplomacy would take its course. We followed their advice and took it one step further, by constantly proposing new ideas to resolve the conflicts. Just this past spring, we offered the separatist leaders sweeping autonomy, international guarantees and broad representation in our government. Our offers of peace were rejected. Moscow sought war. In April, Russia began treating the Georgian regions of Abkhazia and South Ossetia as Russian provinces. Again, our friends in the West asked us to show restraint, and we did. But under the guise of peacekeeping, Russia sent paratroopers and heavy artillery into Abkhazia. Repeated provocations were designed to bring Georgia to the brink of war. When this failed, the Kremlin turned its attention to South Ossetia, ordering its proxies there to escalate attacks on Georgian positions. My government answered with a unilateral cease-fire; the separatists began attacking civilians and Russian tanks pierced the Georgian border. We had no choice but to protect our civilians and restore our constitutional order. Moscow then used this as pretext for a full-scale military invasion of Georgia. Over the past days, Russia has waged an all-out attack on Georgia. Its tanks have been pouring into South Ossetia. Its jets have bombed not only Georgian military bases, but also civilian and economic infrastructure, including demolishing the port of Poti on the Black Sea coast. Its Black Sea fleet is now massing on our shores and an attack is under way in Abkhazia. What is at stake in this war? Most obviously, the future of my country is at stake. The people of Georgia have spoken with a loud and clear voice: They see their future in Europe. Georgia is an ancient European nation, tied to Europe by culture, civilization and values. In January, three in four Georgians voted in a referendum to support membership in NATO. These aims are not negotiable; now, we are paying the price for our democratic ambitions. Second, Russia’s future is at stake. Can a Russia that wages aggressive war on its neighbors be a partner for Europe? It is clear that Russia’s current leadership is bent on restoring a neocolonial form of control over the entire space once governed by Moscow. If Georgia falls, this will also mean the fall of the West in the entire former Soviet Union and beyond. Leaders in neighboring states — whether in Ukraine, in other Caucasian states or in Central Asia — will have to consider whether the price of freedom and independence is indeed too high. 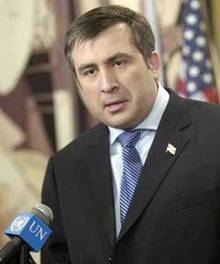 Mr. Saakashvili is president of Georgia.